There are tons of Pinterest Boards devoted to decorating white porcelain plates with Sharpie markers. I decided to get in on the action! 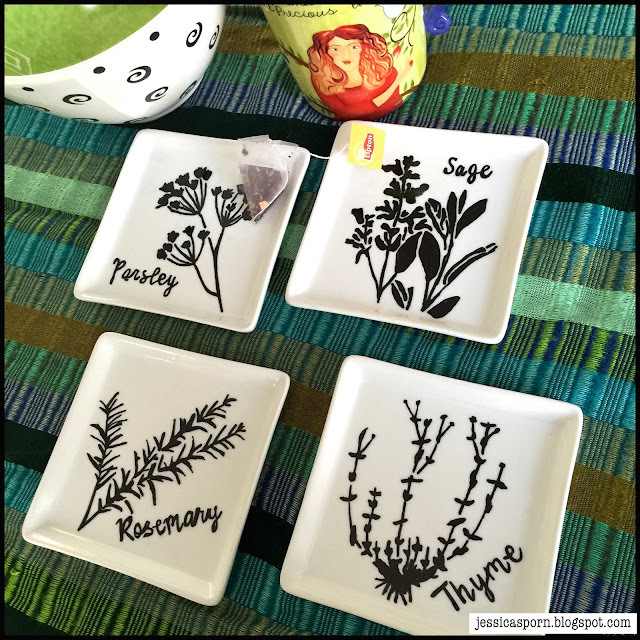 Here are the steps I took to decorate four small plates using my newest "Herbs" stencil from Stencil Girl. I washed the plates first, to make sure there was no residue. 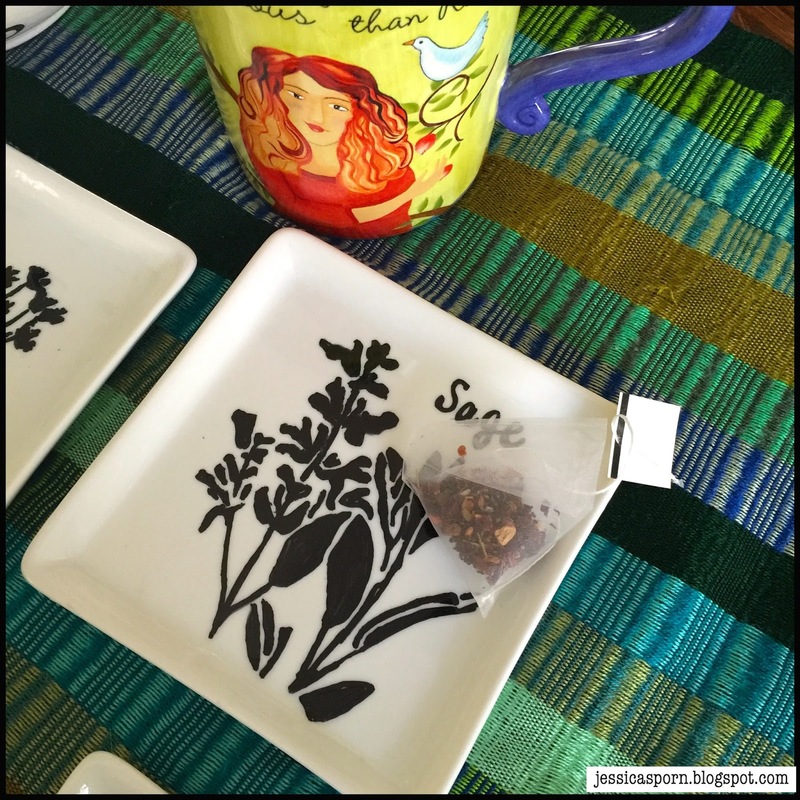 After I figured out the placement of the herbs, I actually cut up my stencil (GASP!) 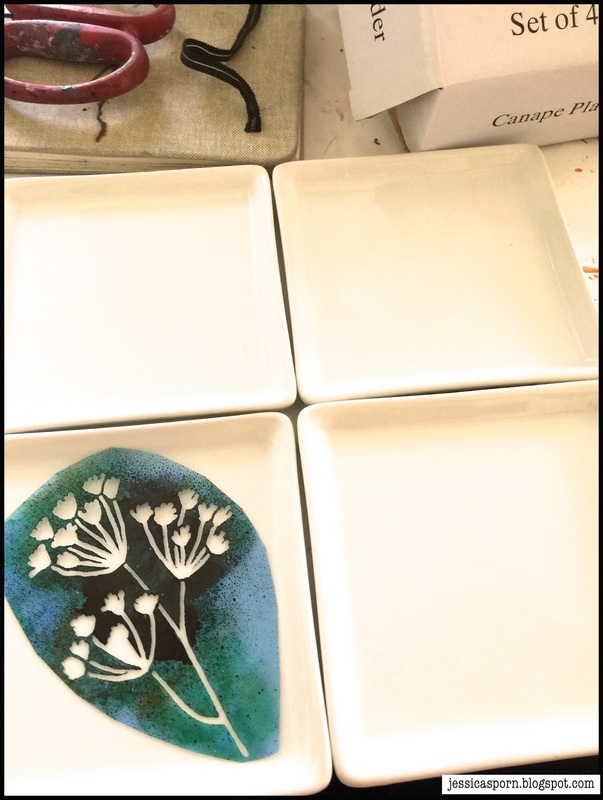 to make it easier to lay the stencil motifs on the plates. I sketched in the motifs, using Sharpie Oil Paint markers. It was good to have both the fine and extra fine tips depending on the size of the opening of the stencil. 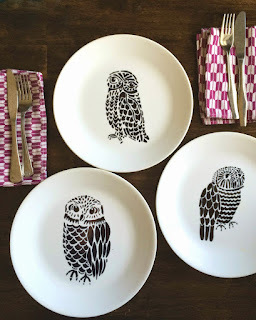 These are basically the same steps that Vanessa Spencer used to create these gorgeous plates using the Three Owls and a Branch stencil. 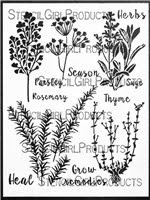 The Herbs stencil is inspired by Scarborough Fair, one of my favorite songs. So what do you think? Are you inspired to create your own unique dishes? 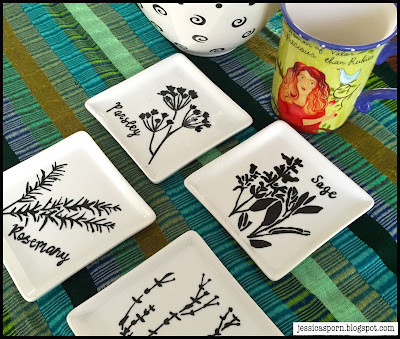 Click here to see demo posts of all my new stencil releases! Comment to win one of the "Herbs" stencils. Next Tuesday, I'll go back and update this post with the winner, so remember to check back! And the winner is Amy! Congratulations!! These are beautiful, Jessica. 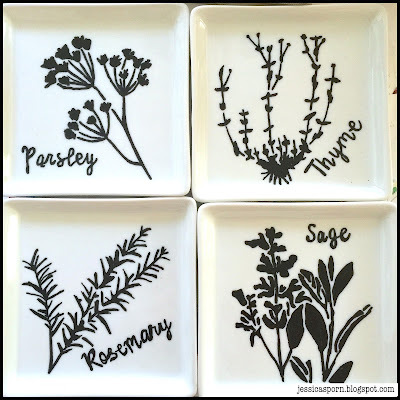 I would love to try this...and being an avid gardener, I love the stencils! Oh my how wonderful! I should make something like this for my sister! She would love it!! So clever and I love that stencil!! Love this! I'm going to give this a try! Thanks for sharing. Wow. Those turned out really pretty. Just tells us, your really can do anything with stencils. Thanks for the inspiration. I need to do this. amy_cj79 AT Yahoo dot com. AMY -YOU ARE THE WINNER! Congratulation. I am emailing you for your snail mail address. And again I forgot my ecgronroosatgmail -Every time!!!! sigh!!! 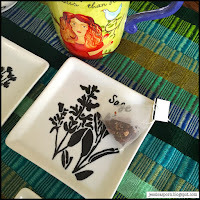 Fabulous idea for a personalised gift. Love the song...takes me back just a few years. These are so pretty and would make wonderful gifts. These are lovely! 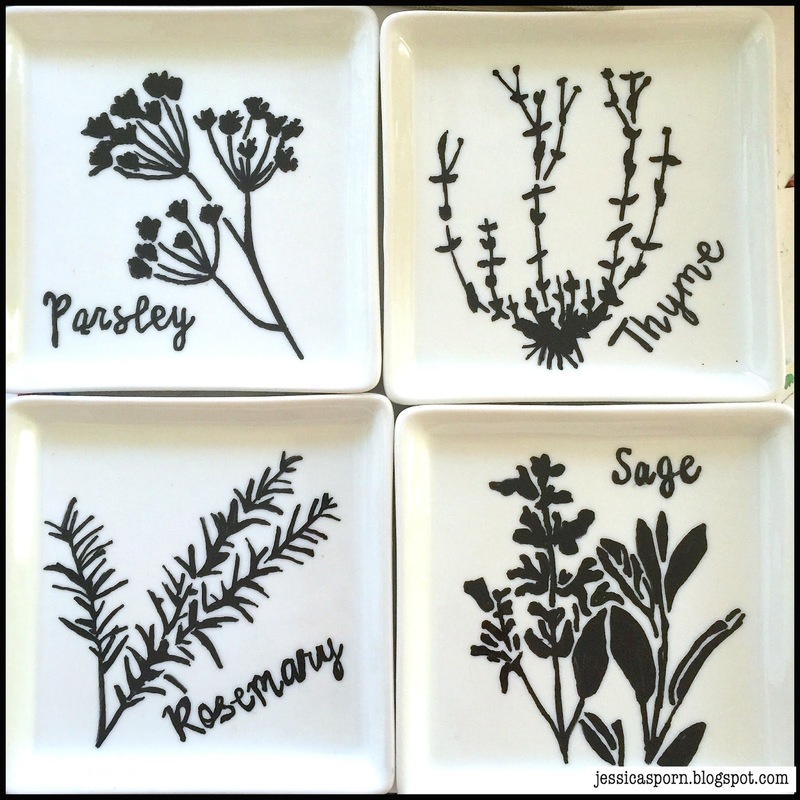 I love the stencils! Thanks for a chance to win one. Mc-reeda@seovec.org. These are so cool!!! What an idea and so beautiful!!! beautiful dishes and I would love to try your technique. Thank you.